Breaking balls sometimes get short shrift these days. Perhaps because of their strong platoon splits and weak (but probably real) correlation with injury, it’s the change up that teams are insisting their pitchers learn. Brett Anderson is a product of a baseball family and one such organization, and yet he continues to ply his trade mostly by throwing a strong breaking ball or two, when he’s healthy. 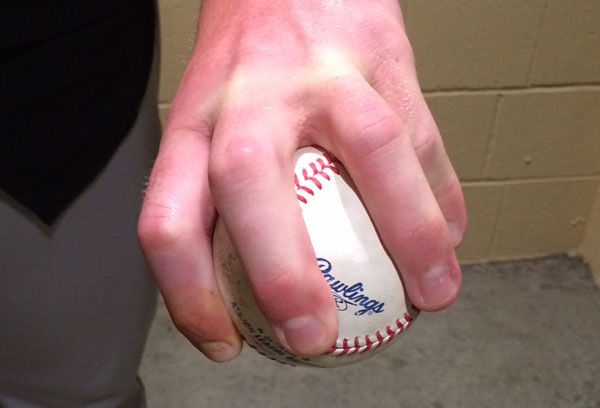 Is it one pitch, is it two pitches, does it lead to platoon splits, does it lead to injury? His slurve knows all. Or at least a bit. The curve ball is a little less frequent. 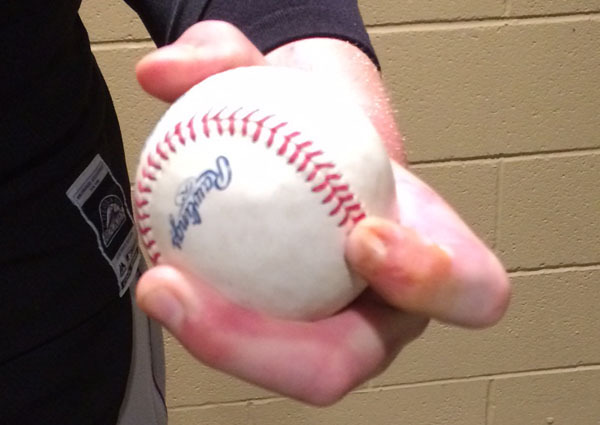 “I kind of keep my wrist stationary and try to throw over the top of it,” Anderson said of his curve. He talked of a different arm slot, but also hand placement and follow through. 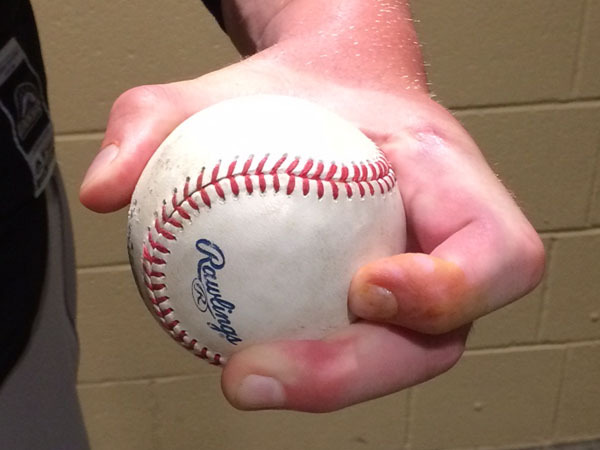 With the same grip, but a different release point and wrist usage, he gets a more traditional curveball. 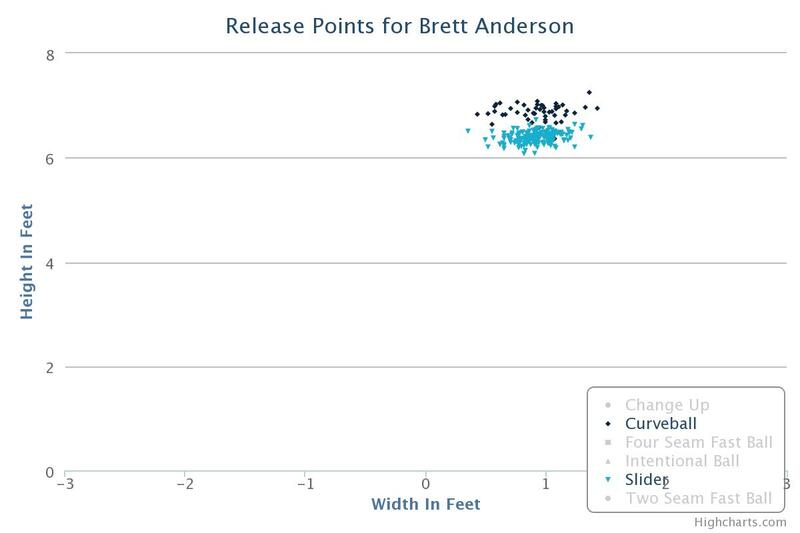 From Baseball Savant, the release points on Anderson’s slider and curve. 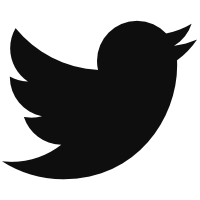 The slider? What “other people call a slurve”? The pitcher estimates he’s gotten 95% of his strikeouts on that pitch. That’s his true bread and butter. With only an alteration of the seams, he uses that same spike grip, but makes sure to “stay behind it and throw through it” for the slider. Why hasn’t the pitch led to the platoon problems normally associate with a slider? For his career, righties have hit for a lower wOBA (.303) than lefties (.326) despite the fact Anderson throws a breaker nearly 30% of the time with his left hand. For one, Anderson feels he has exceptional control of the pitch. “I’ve been able to spin stuff since an early age and feel comfortable doing that,” Anderson said. “Almost feel more comfortable throwing breaking balls for strikes than heaters sometimes — it’s natural.” According to Brooks Baseball, Anderson’s slider has the lowest ball rate of any of his pitches. Is he worried about the breaking balls in Colorado, where the pitch notoriously flattens out, and other pitchers have ditched the curve? “It’s all I have, I have no choice,” said Anderson. He said it was an adjustment — the first time he threw his curves to a catcher in Coors Field, his catcher stood up to receive them and they laughed — but “it’s not the drastic difference that comes with the Coors Field stigma,” as the Rockie pitcher put it. “There with the altitude and the thin air, you have to make sure you stay through it or you’re going to hang it.” In other words, its an adjustment but not a big one. “There’s no get-me-over in Coors Field,” he added. The slider in Coors this year. 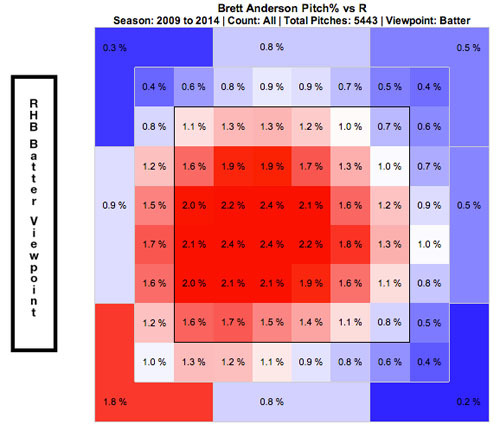 In the end, Anderson felt he doesn’t have much of a choice about his pitching mix, as you can tell. When he throws a change up, it “comes out and then it turns into a BP fastball at 85, no movement,” Anderson said, shrugging. Even added sinker usage hasn’t translated to a better change up. Maybe it’s just the length of his fingers, but it just hasn’t happened for him despite trying many different grips. Anderson doesn’t throw this change up very often. In response, Anderson has tried to create a pause in his delivery this year to slow his lower body down. Not quite Johnny Cueto or Roy Halladay, but like them, he hopes this will give his upper body a chance to catch up. “After throwing thousands of pitches, it’s going to be hard to change your arm speed, so it’s easier to manipulate your body,” Anderson said of the tweak. The curve, thrown with his pre-Tommy John delivery. Anderson hasn’t had the easiest career, and those fluke injuries (and short fingers) are just something he’ll have to deal with. He probably won’t add a changeup at this point. And yes, some people call his breaking ball a slurve. But that’s not a dirty word to him. He’s got great command of two breaking pitches and a good sense of how to use them to get batters out. He thinks the pitches will survive the thin air, so he’ll keep spinning them out there. We hoped you liked reading Brett Anderson’s Breaking Ball: Slurve’s Not a Dirty Word by Eno Sarris!